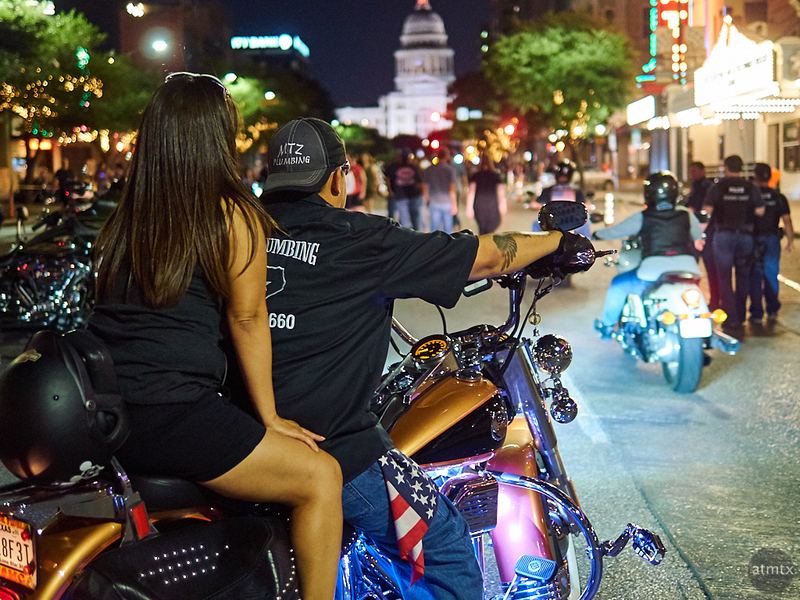 As I was going home from the ROT Rally, heading up Congress Avenue, the bikers who had parked hours earlier were also clearing out. They were probably headed to the Expo center for more late night enjoyment. I, however, was ready for bed. Appropriately, this post ends my epic 24 day coverage of the ROT Rally. I shot them all during four hours on that Friday night, a few weeks ago. You can tell, I’ve used a variety of styles. I experimented with motion blur as well as tripod-less HDR-ish images. I shot the street, making candids and portraits in a classic monochrome, as well as color. I shot these photos with two Olympus cameras. The OM-D E-M5 Mark II and PEN-F attached to the 12-40mm f2.8 zoom and 25mm f1.4 prime. Two cameras, two lenses and several different styles. Good or bad, I’m experimenting and with minimal gear. I hope you found the series interesting. Michael, I was bummed that I couldn’t join you. I was out of town.